It is a Blog and more recently a Website building platform and system. We recommend the use of WordPress for several huge reasons. 1. It is easy to build and understand. 2. You, not a server company or web company (such as Homestead or Web.com) control the site. You are able to change or update the site hourly, daily or never! You are in charge. Blogging or setting up a news page or website was never easier. We will guide you through it. Learn how to control and update your site without using code. One need only navigate the menus to build, control and update your website as you see fit. 3. We instruct you, as we do with the radio process. Then, unless you get stuck, you really will not need us. 4. 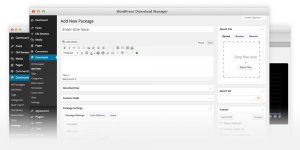 When you use a server such as SecurenetSystems we load the WordPress software on your server. You never need to deal with that! 5. You set the password and control access. 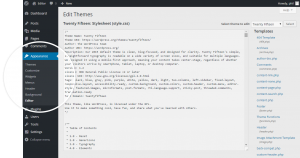 We show you how to find and pick themes. We help you choose useful plug-ins and widgets that make your site look great. Our site, Dyersville New Media, is a WordPress site! 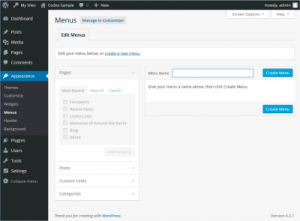 WordPress uses a menu navigation builder that makes website construction easy! Add animation, images and sound without code! If you are a coder or a person who enjoys and understands css, html and php, then WordPress is perfect for you. You are able to adjust code in the editor if that’s your thing! Pretty much nothing! Please don’t get us wrong, there are many fee based themes. There are also thousands of free themes. Themes can cost from $29.00 to $100.00. The price for themes varies by company and type. Some plug-ins and widgets may also cost a little money, many are free. They are well worth it. We do charge a small fee for server set up. Our regular fees and rates apply for site building. Once we show you how, you won’t need us at all! Click on the banners at the bottom of the page. Molly Shepard’s site was constructed over a weekend. It uses a paid theme designed for Molly’s special type of business. This theme was then manipulated to fit Molly’s exact needs. Any WordPress website theme can be “adjusted” to your company’s requirements. There are so many themes for so many types companies or businesses. Field Of Nightmares Radio, FONR was constructed with Indie music in mind. A regular radio theme just wouldn’t cut it, so we modified one to fit the stations specific type of format. We, you, can do that. You can literally change themes daily if that is what you need. There are a number of plug-ins and widgets on this site that make it interesting and sticky.